These lights cast a warm white glow over your favourite photos, artwork, daily reminders, mantras, and post it notes while illuminating your home with this 40 clip LED String Light Set by Sansquare. The string light measures 17 feet with a clear cable and 40 warm white LED lights. 40 clear clips are included attached to the string lights 4 Inches apart so you can hang your coolest snaps and memories. The versatility of the lights being battery-operated, you can hang them anywhere indoors/outdoors (NOT WATERPROOF). These lights can add so much elegance to your home décor at a reasonable price. 1. How Many Photos can I Hang? 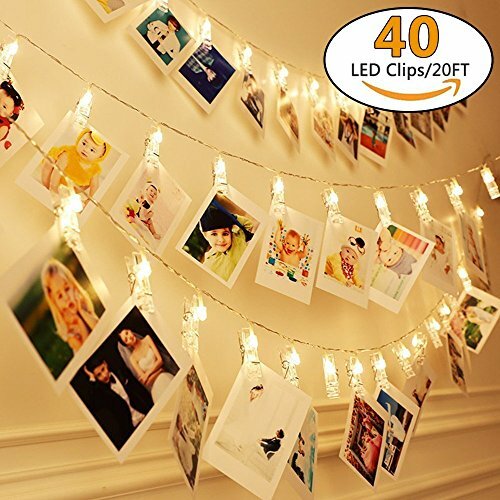 The led photo clip string lights are 17 feet long with 40 clips and a spacing of 4 inches apart. This allow up to 40 4X6 photographs without overlapping. However, if you're hanging larger photos you will find that they overlap. Also you will need a stronger hook to hold the weight of larger items. 2. What size photo works best? 3. What's the best way to hang them? We have included small clear removable hooks for your convenience. After you mount the lights to your desire, carefully open the pins and clip your cards or photos. 4. What is the spacing between each light? ✔40 LED PHOTO CLIP STRING LIGHTS: The 17 foot long battery operated string lights consist of 40 LED clips with a 4 inch spacing allowing you to hang up 40 4X6 photos easily. Each transparent photo clip has an inviting warm white glow that will bring vibrant life to your home décor, gallery, party, wedding, special events, Christmas and holidays. ✔BATTERY POWERED & CONVENIENT: Easy to install anywhere as you don't require an electric plug for power supply which also makes it safe for your children as you won't have cords hanging down. You can organize your pictures or cards so there ready for display and are easily changeable at any time. The portable string light is very easy to mount using small clear removable adhesive hooks. You will require 3 AA batteries (Not Included). ✔PERFECT for DIY TIMELINE PROJECTS: Use these clip lights to help recreate those special moments by displaying them in a timeline sequence for babies room or memories of vacations, holidays, or weddings. You can even use them for you're to do list, post it notes, or personal mantras. ✔GIFT to FRIENDS and FAMILY: This is the ideal gift for family and friends to display special pictures in their home. The inviting string lights pair well with a camera that will bring life and a warm magical feeling to a kid's bedroom or college dorm room. They can also be used to decorate the Christmas tree or hang up Christmas cards on the mantle. ✔RECREATE MEMORABLE MOMENTS: Recreate those special romantic moments spent with your family or friends and showcase them in an inspiration way. Decorate for all holidays, weddings, showers, gardens, parties even use these lights in your business to display your success or trendy way to display special items for sale. Display those precious moments or fun events perfect for your bedroom or living room to add a elegant warm atmosphere. If you have any questions about this product by Sansquare, contact us by completing and submitting the form below. If you are looking for a specif part number, please include it with your message.